...under the table on the left, it’s a school lunchroom, though I can’t for the life of me think of any school name (or any name for that matter) ending in “kimg “ or “kimc”. It also looks like the letter mostly obscured which proceeds those 4 might be an “a”. Judging by the “Margarine Served Here” sign, I’d say World War II for the time period. I think that's an N - look at stylization of the H in School. I don't know if the one in the back is Richie Cunningham, but the one int he front is definitely Vinnie Delpino. Who? The guy in the plaid? He looks familiar but not Richie Cunningham. Maybe Chip Gaines from Fixer Upper? Or are you talking about the guy in the white shirt being served the pastry? He looks more like a young Jon Voight with a buzz cut. Looks kind of like a young Ted Kennedy. Based on the "D" on the sweater on the boy in front, I'd guess Dorchester High. So I vote Dorchester High lunchroom, the forties. Unless Don Bosco uses a D, then all bets are off. I think it's actually Chuck. Been wondering where he disappeared to. Industrial-size loaves of Wonder(ish) Bread! I'm wondering why they were serving margarine up by the ceiling. marketed as being healthier than butter, something we know now to be the opposite of the truth. If a modern marketer were naming it, it would probably be known as soy butter, with the dairy industry objecting to the usage. 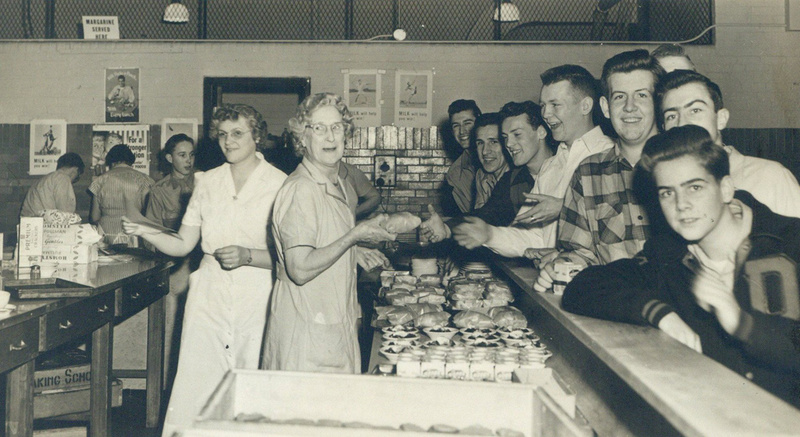 It its earlier days, per my grandma (in her later years, a dead ringer for the lunch lady on the right), margarine was sold by law with the yellow coloring separate: you had to mix it in at home, a measure designed to prevent it being sold falsely as butter. Fun fact: many old-school Buffalo, NY wings joints still prefer margarine to butter in the Buffalo sauce. To my eye, the haircuts look mid-1950s. Serious pomp on the kid in front. That is true. For my dad that came home from the war, we weren't allowed margarine in the house! All because of his memories of the lard like substance with the yellow coloring. Only butter was allowed, yet mom would use margarine to cook with but kept it hidden in the back of the fridge. Dad was serious, I think that stuff represented bad times to him and he didn't want to go back. There was an article about this at the BPL a few years back. Either late in the day the photo goes up or the next day, in a comment titled "The Answer." So if you call up all the comments (on the home page, click on the photo to get to the discussion), then search for The Answer. you'll find them interspersed with posts about, oh, the American Revolution and stuff. Same haircuts. Full of hormones, just like you. Invincible, just like you feel. The world is their oyster. They believe they're destined for great things, just like many of you, their eyes are full of hope, just like you. Did they wait until it was too late to make from their lives even one iota of what they were capable? Because, you see gentlemen, these boys are now fertilizing daffodils. But if you listen real close, you can hear them whisper their legacy to you. Go on, lean in. Listen, you hear it? - - Carpe - - hear it? - - Carpe, carpe diem, seize the day boys, make your lives extraordinary." This is indeed the Dorchester High School cafeteria. We don't have an exact date for this photo, but based on the other photos its filed with, the signage, hairdos etc, we're dating it in the late 1940s/early 1950s. If you have access to Dorchester High School yearbooks from the era you might be able to narrow it down further. Well, 'ethnic' profilng since everyone is the same race here - I'm going to say this was taken within a mile of Codman Square. Those kids are dressed and coiffed like the ones I went to school with in the late '50s. I don't think anyone wore a buzz cut until the end of that decade. I'm voting 1958-1960. I think that box on the shelf may just say "Baking School." Maybe it was a brand or something? "I remember when this photo was taken"
On a side note: I want the vintage Dot High varsity jacket featured in this photograph very much.